At Celibre Medical, we know you have a lot of choices out there for your Botox cosmetic dermatology needs. We understand that Botox cost and value are extremely important to you as you evaluate different facilities in the search to find one that is right for you. But we also want you to know that you should never assume that they all are equal in terms of serving your best interest and providing ethical and quality care. Over the years, we’ve become aware of some shocking and rather unbelievable practices that occur amongst our competitors and we want to share them with you as well as provide you with ways to weed them out and prevent falling victim to them. Demand that your Botox is from the United States. This one sounds like a no-brainer, but you’d be surprised how many practices will pad their bottom lines by ordering illegally from outside the US. We’ve spoken to the manufacturer’s representatives who tell us that there are a large number of providers in the U.S. importing both Botox and Dysport from Canada, Mexico and China and injecting their patients with it. This is an ILLEGAL practice that not only calls into question the morals and ethics of these practices, but also raises huge safety concerns for their unknowing patients. The ONLY way to be 100% certain of what is in that neurotoxin vial is to legally obtain it from the manufacturer inside the U.S…. period. If you’re paying less than $10 per unit for your Botox, then you need to be asking questions. Ask for the Lot number of the Botox that you’re being treated with and check that it is a valid one manufactured here in the U.S. with the maker, Allergan. Know the number of Botox units that are used for your treatment. If the practitioner injecting you talks about your Botox (or Dysport) “by the area” or “by the syringe”, then you need to ask the follow up question of, “and how many units is in that?”. You may believe you are getting an unbelievable bargain to have your crow’s feet treated for $150, but you may only be getting 10-15 units of Botox, which is not enough to give you a good result. The only way you can compare two practices fairly in terms of price is to know exactly what you are being sold and how many Botox units. On the flip side, you will also protect yourself from paying and getting too much by doing this, which may not only save you money, but also keep you from unwanted side effects from being overdosed. As crazy as this may sound we have become aware of the practice of re-using partially used prefilled syringes of Botox in different patients. Yes, you read that correctly! There are some practices that pre-fill syringes of Botox and keep them ready to use. When one of these syringes is only partially used on one patient, the practitioner will simply change the needle and use the rest of the syringe on another. This could potentially lead to cross-contamination of these syringes with blood from one patient that is injected into another. It demonstrates a reckless and blatant disregard for the health of all patients, as well as a violation of every regulation and health standard in the practice of medicine and it’s a criminal act! Make sure to guard yourself against this practice by observing your injector dispose of your used syringes into the appropriate sharps/bio-hazard container immediately following your injections. NO ONE should be taking a used syringe out of the treatment room…ever! 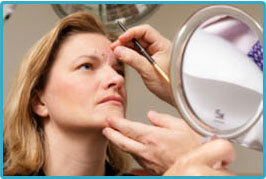 At Celibre Medical, we discuss all facets of your Botox treatment with you at an absolutely free consultation. We won’t treat you until each and every question, including how many Botox units are required, and concern you may have has been answered to your satisfaction. We are here to serve you and want to cultivate an open, honest and up-front relationship with you right from the start. We want to set the bar for excellence in our area and our industry for others to follow. Contact us today to schedule a FREE Botox consultation!